The first question of the Westminster Shorter Catechism is a very good question. You can recall it easily from memory even if you’ve heard it only a few times. The question is pungent with its probing air because it intends to confront each of us with the question of “the why” of our own personal existence. 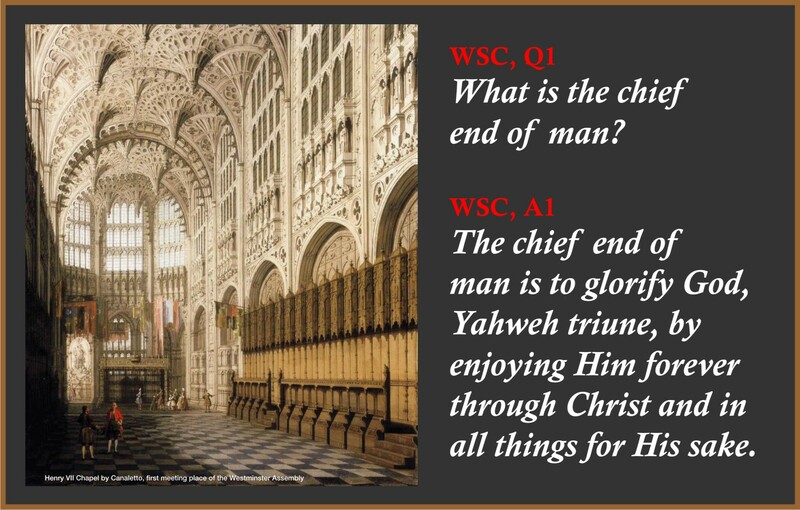 The Westminster Larger Catechism states Q1 this way: “What is the chief and highest end of man?” We could say that the Westminster Shorter on Q1 is a revision of the Westminster Larger on Q1. It will take the reader some reading in Aristotle, in Jonathan Edwards’ A Dissertation Concerning the End for Which God Created the World, and in the writings of the Reformed Orthodoxy at the very least to get a sense of the import of the word “highest” in the Larger. The Larger also includes more than does the Shorter in A1: “Man’s chief and highest end is to glorify God, and fully to enjoy him forever.” That the Shorter leaves off “fully” is also a matter of importance we should give further consideration. We will do so a bit later, but for now the present question on the first question – should we revise the Westminster Shorter Catechism‘s Q/A #1? Q3: Why did God make you and all things ? A3: For his own glory. Q4: How can you glorify God? A4: By loving him and doing what he commands. Q5: Why ought you to glorify God? A5: Because he made me and takes care of me. This is a revision of the Shorter, isn’t it? If so, we should be careful to affirm that the children’s catechism is not a departure from the Shorter, even as the Shorter is not a departure from the Larger. I say this because we do not want to pursue revision for revision’s sake. That’s bad on several levels if not solely bad on how rude it is to revise what our father’s have affirmed, not speculatively, but to be indeed the truths of God from His own Word. The chief end of man is to glorify God by enjoying Him forever. Some Reformed theologians have taken issue with Piper on this. They don’t all disagree for the same reasons which I think shows a weakness on their part from rhetorical angle. Positively considered their critiques of Piper can be considered as nothing less than in the vein of church’s theologians offering commentary from various angles on the core principles of the Faith. I think some misunderstand Piper to be saying: To glorify God by enjoying *ourselves* in Him forever. Sure, there is a way of religion which makes man the terminus ad quem, makes man the final destination for its pious efforts. IOW, the idea of God in service of man. Yet, taken in its simple expression “…by enjoying Him forever” God is still the chief end. 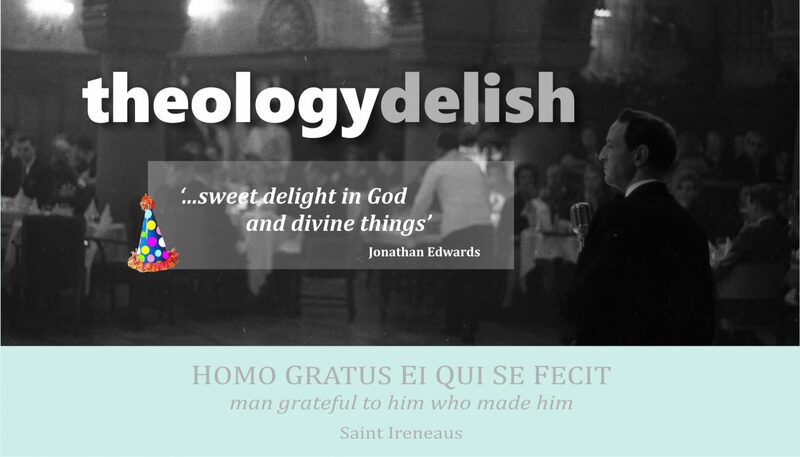 The change that is helpful when adding “by” for “and” is that “glorify” does not stand apart from internal delight in God. Rom 12:1-2 tells us to live unto God from the inside out and thus adding “by” reiterates that pattern. Consider this fun fact. According to Reformed Books Online there have been published 151 commentaries on the Shorter and a total of 4 commentaries published on the Larger. One of my favorite commentaries on the Larger in my possession is one by Thomas Ridgeley (1667-1734). His long title is, A Body of Divinity: Wherein the Doctrines of the Christian Religion are Explained and Defended, Being the Substance of Several Lectures on the Assembly’s Larger Catechism. In Ridgeley’s commentary section on the Q/A1 he works out several key matters for our consideration which are necessary to grasp before moving on to Q/A2. These matters Ridgeley address we can say are so important that it lays a path forward not only for Q/A2, but for the entire catechism. Unpacking here all that Ridgeley says in beyond the purpose of this post so I leave that to you to find and enjoy. I bring attention to Ridgeley’s commentary because in his comments on Q/A1 we find a lovely connection between himself and Piper. Ridgeley’s comments on the words “glorify God” are really good and worth including in your study of either the Larger or the Shorter. Go read Piper first on what he says in his book Desiring God regarding Q/A1 and then find Ridgeley on Q/A1. You will be delighted at the concurrence of opinion and similarity of commitment to the first principles of the Faith between Piper and Ridgeley. On the words “glorify God” Ridgeley lists 8 “by” points that give insight on how man should “glorify God.” There are many more “bys” in Ridgeley’s comments in this section and the following section. What else can we add by way of comment to Q/A1? Surely, if we attempt to say everything that we can say on Q/A1 we will no longer have a catechism answer, but a systematic theology. So with economy of words what else should we say that is essential to the question being asked about our “chief end”? As for what we should say in answer to Q1 I believe there a few things which may have been assumed at the Westminster Assembly and still are assumed. These assumptions have been the undoing of many core beliefs we have long affirmed in classic Protestantism, yea even in the long held catholic doctrines of the Church. A1: To glorify God, Yahweh triune, by enjoying Him forever through Christ and all things for His sake. the benefit of recalling who God is for he has Name which is above every name, an everlasting Name and that Name is Yahweh, the great I AM. He always stands in distinction from all other monotheisms, not as merely another iteration of various monotheisms. the benefit of recalling that Yahweh our God, is triune in both the OT and the NT though most vividly seen to be so in the NT. the benefit of embracing the “by” of how we are to glorify God (per Ridgeley and Piper and so many others) not only externally, but internally which the “by” accentuates so well.